Most scientists believe that Earth magnetic field is not generated out of a permanent magnet but is induced by the electrons that the Inner Core is continuously emitting, and which happen to flow in the Outer Core in helical paths thanks to Earth’s spin. However, this does explain neither the reasons behind the current collapse of the magnetic field over the western and southern hemispheres nor the reasons behind reversed magnetic field in Antarctica that started to emerge some 10,000 years ago. Some scientists believe that Earth’s spin started billions of years ago after the solar nebula collapsed. As the nebula collapsed its fragments began spinning and due to the accretion, which means the growth of a massive object by gravitationally attracting more matter; the masses started to impact one another causing an angular momentum, leading to keeping the big body spinning. In our everyday experience, it’s the force of friction that tends to stop Earth-bound objects from moving forever. But, for Earth rotation about its axis, there is no force working to counteract its spinning, so scientists believe that there is no need to have any input energy to keep Earth spinning, or if it is stopped spinning, it can never spin again. This hypothesis does not explain why Earth’s spin speed over the last 400 years was not constant as it kept slowing down and speeding up by some milliseconds every day. Some other scientists believe that the initial spin came as a result of an epic collision between Earth and another planet they named Thia that created Earth angular momentum and forced the planet to spin. At the same time scientists tell that following the accretion force, the resultant debris assembled together to form the moon. The saying that accretion helps matter to gravitationally assemble, and as a consequence a spin is created is not valid, since the moon of today does not spin at all about its axis! The magnetic field results from magnetic monopoles. As its name implies, a magnetic monopole has only one magnetic pole (either a north pole or a south pole). In other words, it would possess a “magnetic charge” analogous to electric charge . It is also found that a magnetic monopole is a stream of photons that oscillate at a specific frequency . The magnetic monopoles of a bar magnet, for example, result from the extra spin of electrons which point in one direction, than from the electrons which point in the opposite direction of electron pairs that lie in the optimal geometrical arrangement of the metal. Roger Penrose explains in his book, The Emperor’s New Mind that the momentum wave function formula, that tells the time and position of a photon, is a corkscrew or helix . Thus one can visualize magnetic attraction and repulsion between two magnets as streams of photons with their corkscrew shaped wave functions screwing into ‘attraction’ or screwing out of ‘repulsion’ with each other. As forces do indeed arise from an exchange of particles, it has been suggested that such streams of photons travel in what we call the magnetic force lines. He also explained that all emitted photons must carry some mass since the Einstein’s formula states that E=mc2 where ‘E’ is the energy, ‘m’ is the mass and ‘c’ is the speed of light. Photons exhibit wave-particle duality; i.e. they enjoy and own both wave-like and particle-like properties. Such a wave-particle duality is a central concept of Quantum Physics; the branch of physics that explains the interactions of energy and matter. This duality addresses the inadequacy of classical concepts like “particle” and “wave” in fully describing the behavior of quantum-scale atoms and smaller elements such as photons. A Planck’s formula applies at such minute scale. The formula states that the energy of a travelling photon is proportionate to its frequency E=hf where ‘E’ is the energy, ‘h’ is Planck’s constant and ‘f’ is the photon frequency. Not only because they were colleagues and friends but by putting both Einstein and Planck’s formulae together, we find that the mass of a photon is directly proportionate to its frequency or E=mc2=hf. This means that the higher the frequency of a photon gets, the higher its mass becomes. Since mass in motion creates force, magnetic force is hence produced following Newton second law of motion; F=ma, where ‘F’ is the force, ‘m’ is the mass and ‘a’ is the rate of change of particle velocity with time. Such a force that is established between any two magnets could, therefore, lead to a force that is strong enough to tilt one or the two magnets off their original positions. So, what is the source of Earth Magnetic field, you may wonder and what forces are causing both its poles to move eastward? Many observations came to my attention; while appeared not related but somehow they appear to be consistent and recurring such as: Earth magnetic poles are moving eastward; the distance between the 2 magnetic poles has increased by 800 km since 1900 when measured across the Atlantic, Reverse Magnetic Flux (Plasmoids) emerged in Antarctica, in 27 years Saturn has slowed down its 11 hours 39 minutes spin by 8 minutes, in 22 years, Venus has slowed down its 243 Earth days spin by 6 minutes, and last but not least Venus and Uranus are spinning in a direction contrary to other planets. These observations compelled me to go back to basics and re-introduce the Coriolis force as an inertial non-accelerating force, which acts on objects moving in a rotating frame of reference in a direction that is perpendicular to the axis of rotation. Objects would veer to the right in the northern half of the planet and vice versa in the southern half. as an inertial non-accelerating force, which acts on objects moving in a rotating frame of reference in a direction that is perpendicular to the axis of rotation. These observations also invoked me to reflect on my early days of studying electromagnetism at high school. Electrons flowing in the Outer Core would appear from an external frame of reference as if flowing in helical paths. Following the Coriolis force, Electrons loop in anti-clockwise direction in the upper half and in clockwise direction in the lower half of the Outer Core as shown above. Electromagnetic Right Hand rule speaks of induced magnetic field at the center of electron loops. Combing the Coriolis force and Electromagnetism’s Right Hand rule leads to induction of 2 magnetic field force lines of south polarity each, when traced to the surface of Earth at the northern and southern geographies. When all induced magnetic field force lines are running parallel to the axis of rotation as manifested above, one should expect the resultant of those lines, otherwise called a magnetic pole to occupy a co-centric fixed location with each geographical pole. But, this is not the case, as we observe the continuously wandering magnetic poles on the surface of Earth. There is currently a 10° gap angle between Earth’s axis of rotation and the imaginary line connecting the magnetic pole in the Arctic Circle to the center of Earth. This gap angle is changing as manifested by the wandering poles. If the magnetic field that we observe on the surface of Earth arouse from the free electrons flowing through the Outer Core, as most scientists claimed, then we should expect to observe no gap between the centre of the induced magnetic field at northern and southern geographies, and the axis of the rotation of Earth! Why then does such a 10° gap angle exist in the Arctic and a 23° gap angle exist in Antarctica? Moreover, why are they continuously changing. The Inner Core is made of radioactive matter, and it emits heat and electrons at the same time. Following the Coriolis force, electrons flow in perpendicular paths to Earth axis of rotation, or east-west direction through the 1,220 km (763 miles) radius body of the Inner Core. The University of Illinois together with colleagues at Nanjing University have announced that the Inner Core has an inner core of its own. The solid iron crystals in the outer- Inner Core are aligned in north-south direction. The solid iron crystals in the inner-Inner Core are aligned roughly in east-west direction. This made me deduce that the outer-Inner Core is made of Ferromagnet that has permanent magnetic characteristics, and as such it has its crystals aligned along with its magnetic field function i.e. north-south. This made me also deduce that the inner-Inner Core is a non Ferromagnet that has its crystals aligned along with the flow of the electrons i.e. east-west. At the shell separating inner-Inner Core and outer-Inner Core, there interact outer- Inner Core magnetic field force lines and inner-Inner Core electron flow to generate Lorentz force that drives both Inner Core layers to spin as one. On 2011 a research by University of Cambridge concluded that the Inner Core is spinning faster than the rest of Earth. On 2011 a research by University of Cambridge concluded that the Inner Core is spinning faster than the rest of Earth. I believe that Lorentz force at the source of the magnetic field force inside the Inner Core (F1) is greater than that 3,470 km (2,169 miles) away at the Inner Mantle shell (F2) as shown above. The spin speed will follow the Lorentz force applied. Caught by the friction forces of the Inner Core and the Inner Mantle, the Outer Core spins at the average of the 2 speeds. This explains why the Inner Core spins faster than the rest of the planet. 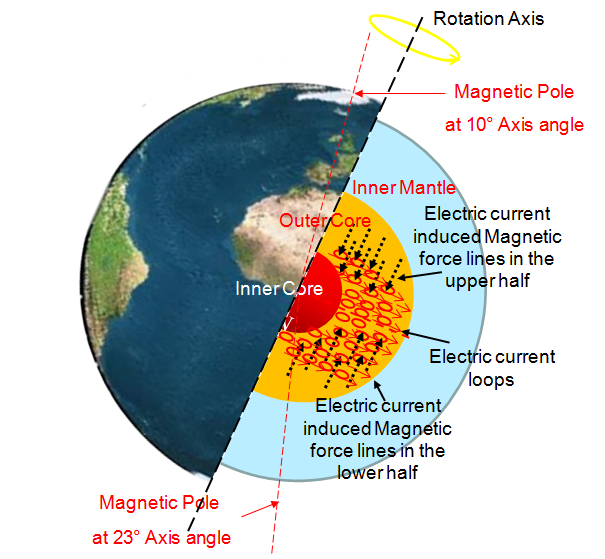 As the speed of the electric current varies along its 2,200 km (1,367 miles) trip from the Inner Core to the Inner Mantle, the strength of the induced magnetic force lines will also vary and will mostly be observed on the Earth’s surface around the geographical poles at the surface projection area of the Outer Core beneath. 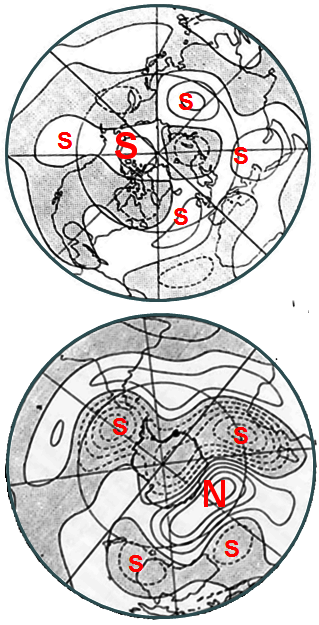 The contours shown in this map are the time rate of change of the magnetic strength in the North and South Poles . Full curves show contours where the rate of change of magnetic flux is positive while dotted contours refer to regions where the rate of change is negative. These latter contours are found to partly overlap with regions of Reverse Magnetic Flux where the radial field points in a direction opposite to that expected for a dipole magnetic field. The contours of negative time variation are seen to straddle almost the whole of the Antarctic continental and large expanses of the adjoining ocean areas below South America and South Africa. There remain strong flux points that define the normal north and south magnetic poles as we observe on a typical compass. The research by the scholars of the Indian Institute of Geomagnetism, Colaba, Mumbai, India goes on to describe four static flux bundles of intense magnetic flux, the two northern ones being located below Arctic Canada and Siberia, and the two southern ones located below Antarctica. The research team have dated such reversal to have only started 10,000 years ago. It is therefore conclusive that earlier than 10,000 years ago the spin speed was slow, and not adequate to have the Outer Core electrons flowing in helical paths and therefore no induced magnetic field force spotted. Did the planet changed its spin speed and started to spin faster which lead the Outer Core electrons to flow in helical paths and an induced magnetic field force started to emerge at both southern and western geographies at the orthographic projection of the Outer Core. In the Antarctica we called it Plasmoids. In the Arctic it was not called anything since it overlapped with an existing magnetic field for south polarity that is differently sourced. I therefore deduce that the final configuration of the sources of Earth magnetism contains i) two induced magnetic fields that emerge out of the Outer Core and are witnessed around Earth Rotation Axis, where the resultant surface magnetism is a ring shape around the geo poles at the orthographic projection of the Outer Core on the surface of Earth. Its strength is proportionate to Earth spin speed and the radioactive life decay of the Inner Core, and ii) one permanent magnet, which is the Inner Core that is free to move inside the liquid viscous Outer Core. Its field is stronger than the induced field’s, and its poles keep wandering on the surface of Earth as the Inner Core tilts, swivel or flips due to attraction forces of magnetic cores of celestial objects such as planets and stars. At this stage, a question jumps to the front; well then, what brings the planet to spin in the first place or to increase its spin speed 10,000 years ago together with the emergence of Plasmoids? Boothroyd, A. (2009). Magnetic monopoles: 70 years from prediction to observation. Institut-Laue-Langevin. Penrose, R., & Gardner, M. (2002). The Emperor’s New Mind: Concerning Computers, Minds and Physics (Popular Science). Oxford: Oxford University Press. It is a myth that the the spinning of the earth more than 10000 years ago could be slow. The dynamic situation of sun, moon,earth and the temperatures on earth would have been adversaly affected. But the history does not point to these situations. The fact of the matter is that civilization flourished 45000 years on wards. Please explai the anamolies. Most predictions assume that if Earth spins slower or spins no more whilst orbiting the Sun, there will be a big difference in temperature between the side facing and the side not facing the Sun. A very detriment to any civilization to flourish as civilizations need mild and sustainable climate to grow. The assumption here is that the thermal energy arriving through radiation from the Sun is the one bringing warmth to the surface of the planet for the atmosphere, the air molecules, water vapour, carbon gases, ..etc to keep it in. However, the model I introduce is different, as I explain that the thermal energy arriving through radiation from the Thermosphere to the Troposphere is much higher than that directly from Sun. The “Earth Temperature” page on this site explains how the Temperature Belts of homogenous climates take the magnetic poles for its centres. The closer the region to the magnetic pole, the colder it is and vice versa. The “Earth Spin” page of this site explains what makes Earth spin and how could the location of the magnetic poles influence the spin speed. In the model I introduced, the magnetic poles play double role as they wander from one geo to another; 1) the relocation of the Temperature Belts and possible climate exchange, and 2) the Spin Speed and different lengths of days. For instance, if the 2 magnetic poles are, at one time, get located in India and Brazil, the magnetic equator at which the temperature is highest on the surface of Earth at sea level, would be passing through Elsmere Island and Antarctica all year round. Thus bringing almost equal warmth at the side facing and not facing the Sun. You may refer also to the “October 2015” post on this site for geological evidences in North Africa (7,000 years ago) and North West China (10,000 years ago) when Earth Spin speed was different. The Pineal Gland plays a role in the speed of aging. If the succession of day and night is fast, the aging is fast and vice versa. Holy books and ancient texts speak of eras when the average age was 900 solar years, 300 solar years and 180 solar years. Currently it is 80 years on average.. You may find more on the “Change Cycle” page of this site.